Mushroom and rice casserole is one of my favourite rice dishes. It makes a perfect side dish, and I usually have it with my proteins such as pork, chicken, fish, lamb, or beef. It is so simple to make and you can keep it for a few days. The great thing is you can use the rice and mushrooms of your choice. 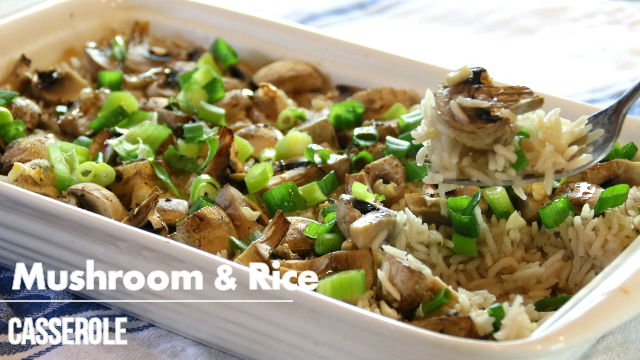 In this recipe, we use button mushroom and basmati rice, but it is up to you. I love garlic on it, but you can use the spices of your choice. For example, a bit of ginger would be nice too. Chicken stock is so good but water or any stock can be used. After baked, chopped fresh green onions for a garnish just seem to top off the dish. Give it a try and let us know what you think of our delicious mushroom and rice casserole. Add the rice, chicken stock to your preferred casserole dish and give it a stir. Place the mushrooms in followed by the garlic, salt, and pepper. Put the dish in the oven and bake for about 40 minutes. Remove it from the onion and garnish with the chopped green onions. Fluff, serve and enjoy your mushroom and rice casserole.